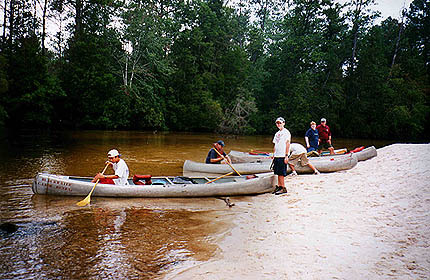 The next morning we ate breakfest, struck camp, and loaded our canoes for the days trip. It was while we were taking down camp that we saw the first people on the river since we left the outfitters at the drop-off point. The true sense of wilderness was truly apparent on this trip (except for the airplanes that flew over at night). During Saturday's paddling we encountered several obsticles that we weren't forced to recon with on the day before. 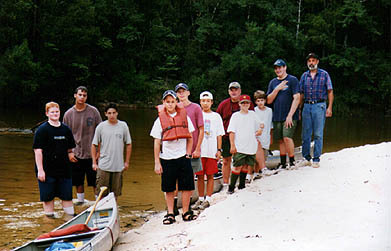 At one spot, the river was blocked by a log jam and Mr. Hendon had to stand on the logs and help push the canoes across. This process took several minutes and we were thankful that we hadn't encountered the afternoon before when we needed to find a camp. Twice during the day we had canoes capsize and several times it looked like it was about to storm. But we finally made it back to the State Park on Saturday afternoon after traveling about 20 miles. After unloading our canoes onto the outfitter's trailer, we rode back to the parking lot. From there, we set up camp in the state park and proceded to dry out the gear that was dunked from the two capsizes. On Sunday, we broke camp and returned home to Tallahasee.